Looks like Wethersfield, CT is getting a little seedy ... in a good way! 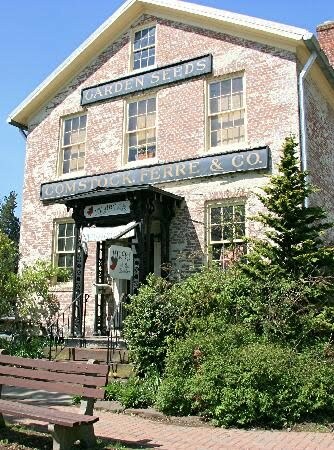 Baker Creek Seed Company has purchased and is restoring Comstock, Ferre & Co. of Wethersfield, CT.
Comstock Ferre is the oldest continually running seed company in the country. It opened in 1820. It's a virtual museum of the Connecticut seed trade and America's agricultural tradition. Baker Creek plans to take this business bac to it's roots by bringing back many traditional varieties from New England. When I was looking into buying seeds for my garden I decided to buy from Baker Creek. I really loved the idea of growing and preserving heirloom varieties. I liked the fact that they only offer open-pollinated seeds, no-GMO. It looks like that philosophy is a good match for Comstock Ferre which has a policy of not selling GM seeds as well. I think a mini road-trip to Wethersfield might just be in order.